Call us or send a message to ask a question about your debit card. Call us or send a message to ask a question about Internet Banking. Call us or send a message to ask a question about the Mobile Banking app. Call us to talk to our friendly customer service team, or find your local branch where our team is on hand to help. In July 2018, we launched our Mental Health in the Workplace initiative. This positive new initiative means anyone in our teams will be able to meet and talk confidentially to someone at work, not only about any issues they are facing, but also if they need some confidential guidance about someone they care about, be it a friend or family member. 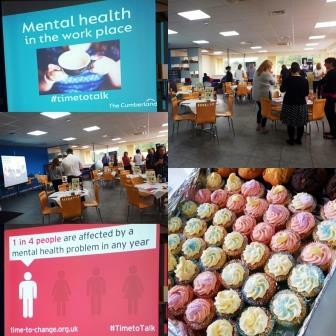 As part of the launch, our Mental Health First Aiders hosted a coffee morning, which gave people from across the business the chance to find out more about them, whilst enjoying a cuppa and some delicious cakes. The morning was a great opportunity to find out more about; Mental Health in the Workplace, the support available, future activities and the chance to give any feedback/ideas/suggestions that people may have in helping to shape and develop this initiative over the coming months. If you want to find out more about mental health support services in your local communities, visit **Mind ** or **Support in Mind Scotland**. A member of the Building Societies Association. Cumberland Building Society is authorised by the Prudential Regulation Authority and regulated by the Financial Conduct Authority and Prudential Regulation Authority and entered in the Financial Services Register under Register Number 106074. Our head office is Cumberland House, Cooper Way, Parkhouse, Carlisle CA3 0JF (customerservice@cumberland.co.uk). Call charges will vary. © Cumberland Building Society 2019. All Rights Reserved.